4th of July is right around the corner, if you can believe it. Maybe you’re wondering if there’s something yummy you can eat that won’t bust the calorie counter. Let’s have a fun holiday and keep all of our buttons in tact! 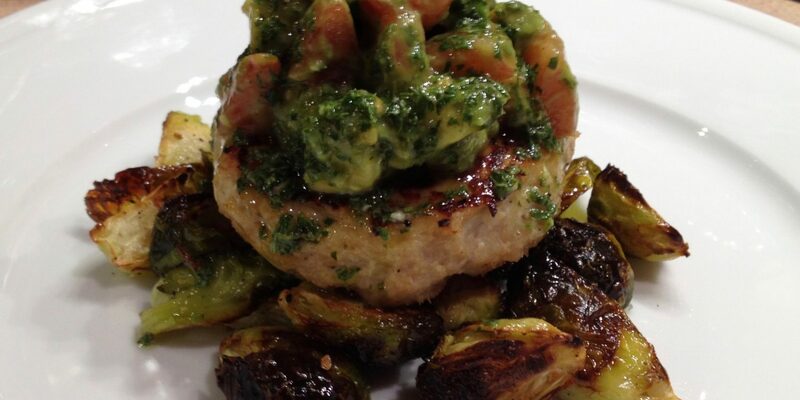 This turkey avocado lime burger can help. Burgers and dogs seem to come with every fourth of July. So do the buns, the pasta salads, the snacks, the desserts, and the beer. Before you know it, you’ve popped so many extra calories, sugar, salt, and carbs into your mouth, your pants start to feel a bit uncomfortable. Hey, I get it. Most of us need treats in our life. I’m just saying you may feel better after your party if you pick a couple of indulgences and not overload on them. A great way to start is with a yummy turkey burger. We trade bad fat for good fat, so you will still feel full, we put a ton of flavor on it so it’s not bland and boring, and we chuck the roll, so you don’t fill up on sugary carbs. Have the beer instead. Or maybe there’s a brownie you’ve been eyeing up. You get what I’m saying. Pick your poison! Cause if you have all the poison…well, it never ends well my friends. These burgers go great with Roasted Carrots and Brussels Sprouts. Keep in mind you can use the same seasoning/recipe and simply grill the veggies instead of roasting them! Grate garlic and shallot. Or whiz in food processor. Put ground turkey in a medium sized mixing bowl. Add salt, pepper, and grated garlic and shallot. Form four 4 oz patties. Whiz garlic, herbs, lime juice, sea salt, red pepper flakes, and sweetener in a blender or food processor until blended. Stop and scrape down any unblended herbs. As motor is running add olive oil in slow steady stream. Whiz until emulsified. Pour into a small mixing bowl. Cut avocado into 1/4" chunks. Stir into dressing. Cut tomato into 1/4" chunks (if using) and stir into dressing. Preheat grill for 10-15 minutes. Let burgers sit out at room temperature as grill preheats, or for up to 20 minutes. Drizzle burgers with olive oil (both sides). Grill for 8-10 minutes or to 165F. You can cook to 160F if you let your burgers rest for 5-10 minutes before serving. They will continue to cook the remaining 5 degrees while retaining their juices in that time. 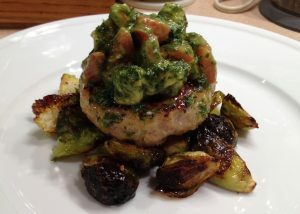 I omit the bun and serve the burger over grilled or roasted veggies. Pour avocado lime dressing over burgers (and veggies) and serve. Enjoy!